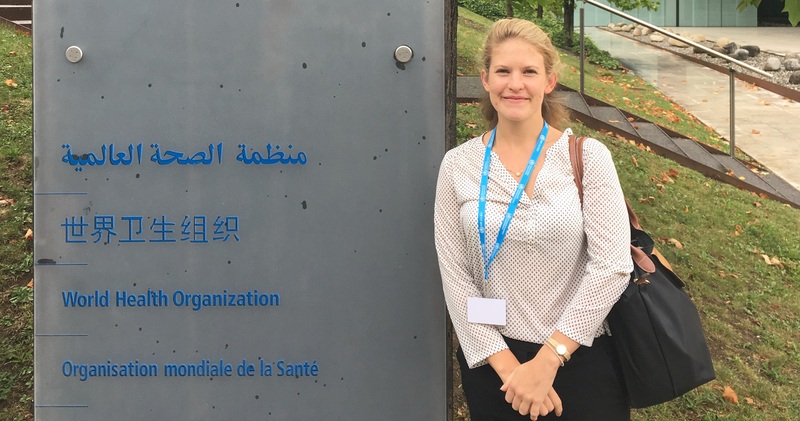 A: Over a two-month placement at the World Health Organization (WHO), I worked with Dr Melanie Taylor in the Department for Reproductive Health and Research (RHR). A major aim of the Department of RHR is the elimination of mother-to-child transmission (EMTCT) of HIV and syphilis. Q: Why is EMTCT of HIV and syphilis a priority for the WHO? A: Mother-to-child transmission (MTCT) of HIV and syphilis remain significant causes of perinatal morbidity and mortality, but can easily be prevented by screening pregnant women and providing appropriate treatment. Untreated maternal syphilis results in significant adverse pregnancy outcomes, such as spontaneous abortion, stillbirth, foetal death, pre-term birth, low birth weight, neonatal death and congenital syphilis (i.e. syphilis infection of the neonate). If a pregnant woman living with HIV is not treated with antiretroviral medication, the risk of transmitting HIV to her child is dramatically increased. Q: How does early diagnosis help with treatment and care? A: Antenatal screening for syphilis followed by treatment early in pregnancy effectively treats the pregnant woman and prevents congenital syphilis in infants. Treating a pregnant woman for HIV can reduce the likelihood of MTCT of HIV from between 15 to 45 per cent to less than five per cent. WHO has prioritised the EMTCT of HIV and syphilis, and several countries have now achieved validation of EMTCT for HIV and/or syphilis, including Cuba, Belarus and Thailand. Q: What were you able to bring to the team? A: My role at WHO involved literature searches and end-user engagement in order to collate data on the performance of rapid diagnostic tests (RDTs) that simultaneously detect antibodies to HIV and Treponema pallidum, the cause of syphilis. It was important to evaluate these dual RDTs and compare their performance to the gold standards for HIV and syphilis diagnosis. In order to ensure that they had sufficiently high sensitivity and specificity, I collated the results of all the available evaluation studies in order to get an overall picture of their performance. I also looked at other outcomes, such as feasibility, acceptability and cost-effectiveness. Our systematic review has now been published in BMJ Sexually Transmitted Infections, and will play an important role in shaping the WHO guidelines for the use of these dual RDTs, which are now being prepared. Q: What are the advantages of dual HIV/syphilis diagnostic tests? A: The advantages of these dual HIV/syphilis RDTs include lower manufacturing costs, streamlined procurement, minimised storage needs, simplified training for healthcare professionals, a single finger prick required for testing, and shortened time for results. In the past, many countries did not test pregnant women for syphilis at all, so these dual RDTs are an exciting opportunity to change that. Q: Has this opened up opportunities for ongoing work with the WHO? A: After completing my internship at WHO, I was contracted to complete the systematic review, as it was a lot of work, and too much to do in two months! I recently presented this work at a WHO Sexually Transmitted Infections Guideline Development Group Meeting and look forward to staying in touch with the team at RHR in the future. Q: How was this opportunity made possible? A: This work was made possible by my supervisor at WHO, Dr Melanie Taylor, who gave me the opportunity to work with her in this exciting field, and Professor Rosanna Peeling who supported and guided me throughout the process. I was financially supported by an MRC Supplement Grant, which was awarded through my MRC Doctoral Training Programme at Imperial College London.